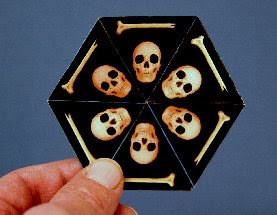 Make this Skull Flipper toy - a flat two sided paper toy, capable of displaying six different patterns, one on each side. Yes, you read that right... two sides, and yet six patterns. Just how is such an astonishing thing possible? Does this odd little toy somehow alter the known laws of physics? Does it bend reality in some strange way? Could playing with this thing endanger the very fabric of time and space? But it's very easy to print and build, and you will have lots of fun flipping it around!